Street Fighter II: The World Warrior (??????????? -The World Warrior-?) is a competitive fighting game originally released for the arcades in 1991. It is the second entry in the Street Fighter series and the arcade sequel to the original Street Fighter released in 1987. 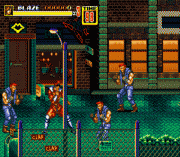 It was Capcom's fourteenth title that ran on the CP System arcade hardware. Street Fighter II improved upon the many concepts introduced in the first game, including the use of command-based special moves and a six-button configuration, while offering players a selection of multiple playable characters, each with their own unique fighting style. The success of Street Fighter II is credited for starting the fighting game boom during the 1990s which inspired other game developers to produce their own fighting game franchises, popularizing the genre. Its success led to a sub-series of updated versions (see below), each offering additional features and characters over previous versions, as well as several home versions. In 1993, sales of Street Fighter II exceeded $1.5 billion in gross revenues, and by 1994, the game had been played by at least 25 million Americans in homes and arcades. The video game console ports to the Super NES and Sega Genesis sold more than 14 million copies, and it remains Capcom?? '?s best-selling consumer game of all time.